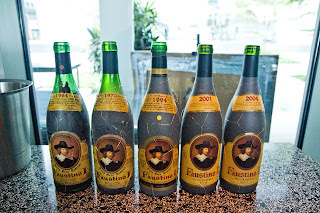 Among Spanish wines, those from Bodegas Faustino have been in Singapore since early 2000. I recall being introduced to this winery when I first ventured to learn about Spanish wines during that period. The dark grey coloured bottle of a Faustino I Gran Reserva wine, with thin gold coloured threads tied around the bottle to form a net which snugly embraces the whole bottle is something easily recognisable and difficult to forget. 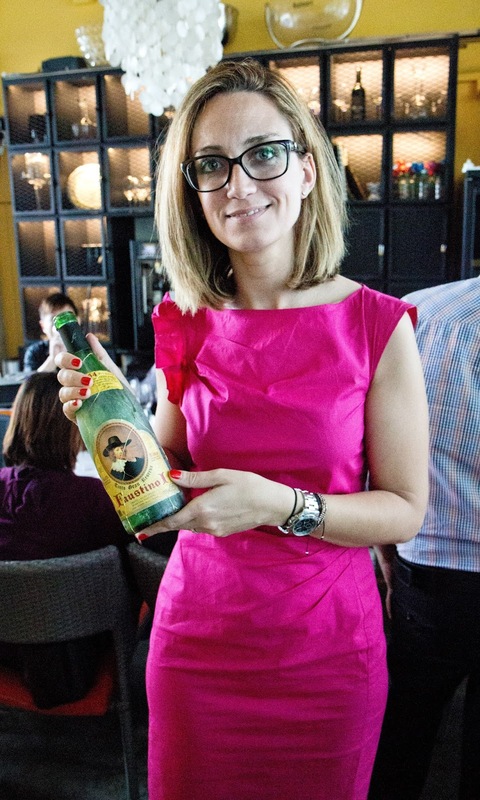 Fast forward to this month, Ms Rocio Munoz Marin (Area Manager of Grupo Faustino) was recently in town to conduct a Faustino Masterclass showcasing a vertical of Faustino I Gran Reserva wines from vintages: 1964, 1970, 1994, 2001 and 2004. 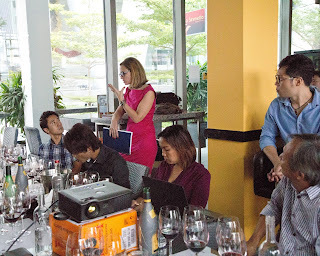 This masterclass held for the local trade folks was organized by Cornerstone Wines and held at La Sirenetta. Spanish winemakers are known for their inclination to produce, cellar and age wines till they are ready for consumption; especially wines produced under the gran reserva category. Though wines under this category requires a '5 years aging' period (a minimum of 2 years in oak and 3 more years in bottle) before release, Spanish wine producers are known to age these wines even longer. Aging has the potential to bestow several pleasing virtues to a well made wine: soft tannins, smooth (even silky) texture, well integrated and seamless body, a good offering of tertiary aromas and flavours are some attributes which come to mind. 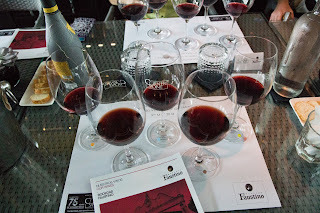 These qualities were reflected in the gran reserva wines offered during this masterclass (though for obvious reasons aromas, flavours and body structure between these wines differed due to vintage difference and aging period of each wine). Ms Rocio highlighted that Bodegas Faustino opts to produce gran reserva wines only during excellent vintages. Looking onwards from 1964, only 13 other vintages have been produced so far: (1970, 1985,1986, 1987, 1990, 1991, 1992, 1993, 1994, 1995, 2000, 2001 and 2004). 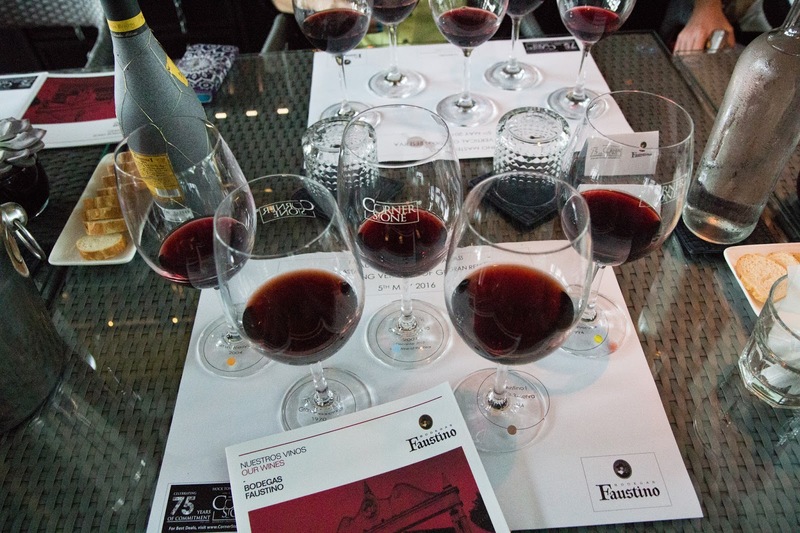 Especially the 1964 and 1970 Faustino I Gran Reserva wines attest to the ability of these wines to age long and age well. Both were remarkably alife, showing well in palate and offered elegant sips to savour; albeit both being at an evolved stage of development. Both these wines are blends (made with Tempranillo, Gracino, Mazuella and Viura varietals; the last varietal being a white). Both also went through a longer aging period in barrels (the 1964 vintage for 36 months and the 1970 vintage for 30 months) when compared to the other 'younger' 3 wines tasted during this masterclass. The 1964 vintage showed a garnet-brown play in colours; lovely display of secondary and tertiary notes: spice, tobacco and cedar; a soft, delicate body with a seamless texture and a lingering finish. It comes as a pleasant surprise to see an old vintage holding well and showing gracefully (There’s a delicateness to its body; I would not recommend aerating this sip too long in the glass though). And it’s a joy to sip this on its own (sans food). The 1970 vintage was stylistically similar to the earlier vintage in terms of complexity, texture and mouthfeel (silky, smooth and well balanced). The fruits however showed with more flavour intensity and boldness in this wine. It certainly gave this sip a degree of masculinity on the palate (if one ventures a comparison with the 1964 vintage). Ms Rocio clarified that 1970 was a warm vintage and the result can be gleaned in the glass. She also explained that winemaking style was tweaked a little over the years to take into account the evolving consumer preference which leaned towards freshness and a noticeable fruit presence in wines. This resulted in later vintages being made with just the 3 red varietals (leaving out the Viura varietal). Also, more colour and fruit extraction (via appropriate maceration and pump-over initiatives during the winemaking process); and a shorter aging period in oak (between 26-29 months) was adopted to reveal more fruit presence in the glass. This change was clearly notable in the 1994, 2001 and 2004 vintages where the colour of the wines showed a deeper red and the berry fruit concentration in palate was more intense and noticeable. The 1994 vintage had the vote of approval from most participants at the masterclass for having a good balance between age and red berry fruit presence (backed by lively acidity) in palate. The cedar, sweet spice and leather notes added to the complexity of this wine. Those who preferred some fruit ripeness in the palate showed favour for this wine. The 2001 vintage showed red berry fruit exuberance and liveliness a notch higher with soft tannins, smooth texture and a well balanced body to match. Wine certainly with a good aging potential. Similarly, the 2004 vintage displayed a good constitution with a potential for further aging. This masterclass certainly offered a learning experience (at least for me) on the ageability of well made and cellared wines Spain has to offer. 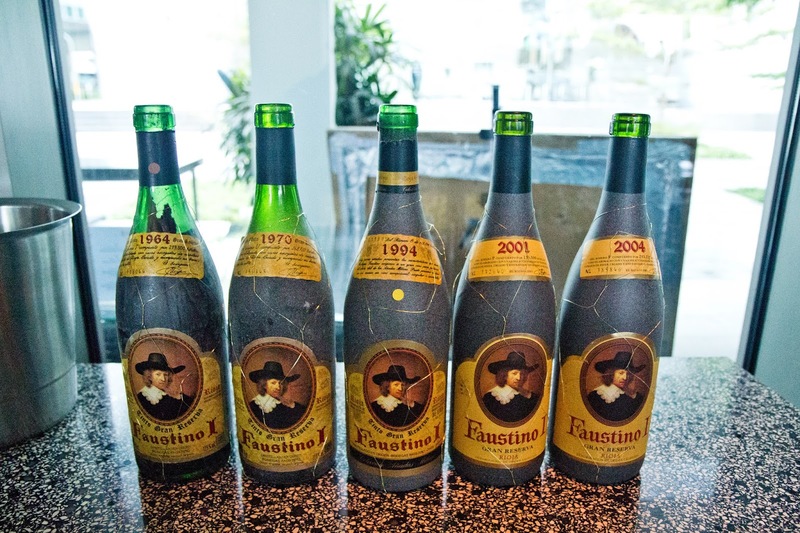 The Faustino wine company has a long history with growing grapes and making wine (around 150 years of it). The early decades though were spent in producing bulk wines. In 1930, a shift was made to produce wines bottled under its own label. Julio Faustino Martinez (the grandson of the founder) who took over the management in 1957, went on to expand the company’s ownership of vineyard lands, plantings, range of wines offered to consumers and added a few more bodegas into the Group’s portfolio. At present the Group’s wines are sold in over 90 countries; with top markets being UK, Switzerland and China.